In 2006 when the Spike Lee x Jordan Brand Air Jordan Spiz’ike’s were introduces to the world, sneaker heads across the globe were intrigued by the unique silhouette that meshed together some of the most sought-after and iconic retro models from the Jordan collection. For the first few years of colorway releases, the Spiz’ike’s were one of the most pricey and hardest sneakers to get your hands on. Now they have become more of a general release and are available at all Jordan Brand retailers and even or up as an option for Nike ID. 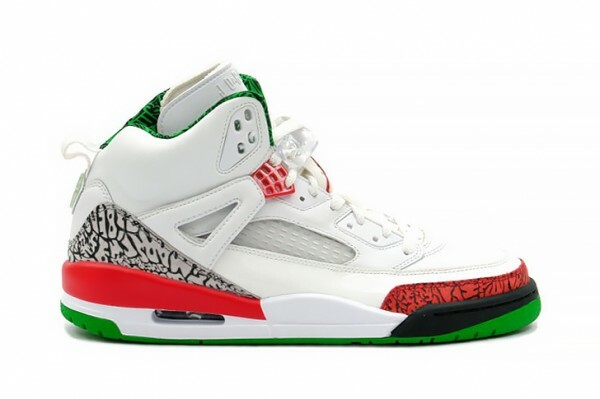 Next month, the OG Christmas-inspired colorway Air Jordan Spiz’ike’s will be making their return for the sneaker fiends who didn’t get a chance to grab them the first go-round. The kicks comeback with their same predominately white upper with red and green accents on the toe, collar and AJ III-inspired soles. The original Christmas-inspired Air Jordan Spiz’ike’s make their comeback August 9th at select sneaker retailers. Hit all your local boutiques ahead of time to see if these will be in stock.